Constantly challenging reason and self-control, the work of David Altmejd departs from references to the natural world and to the human being, but is conducted by a strange voyage to their inner structures, as if synapses that multiply and provide new associations and unexpected thematic connections. 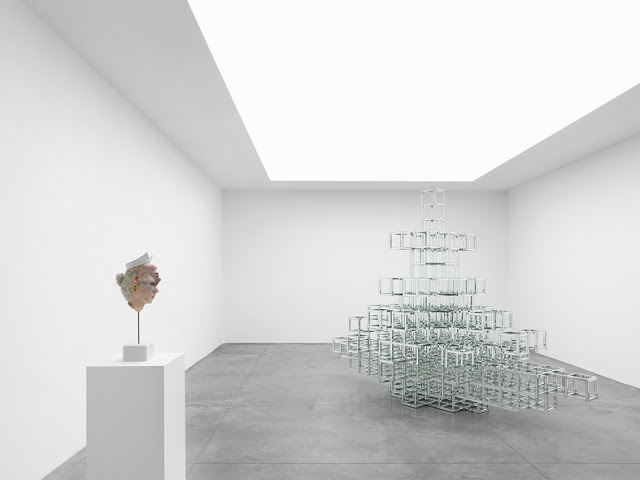 Whether in complex installations such as The Flux and the Puddle, in sculptures that construct/deconstruct themselves (Bodybuilders), or in the open crystallized heads, we witness the tension of an object that constructed itself, as if it was an element that once was alive and that exists by the transit of a strong energy flow. 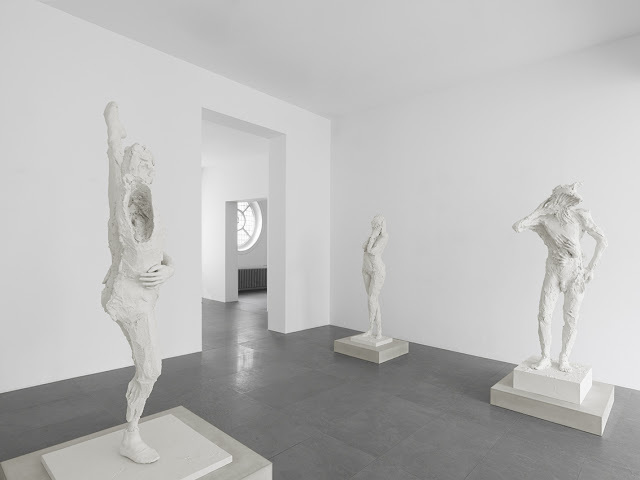 L’Air is the artist’s current exhibition at Xavier Hufkens. The light of the white space dialogues with the sculptures and David Altmejd decided not to superimpose his work in the gallery rooms. 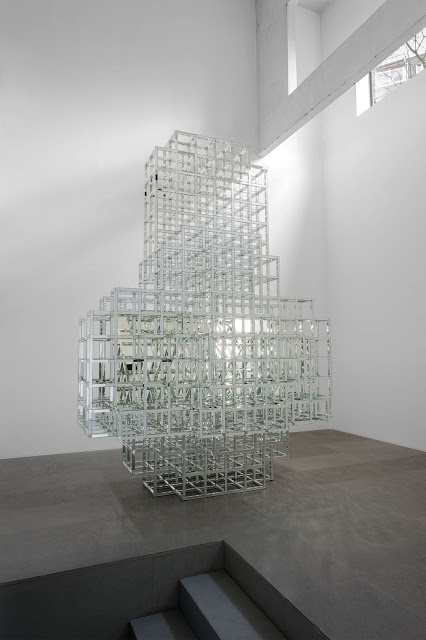 In L’Air, the mirrored sculptures, Matrix, are proof of this lightness and transparency. 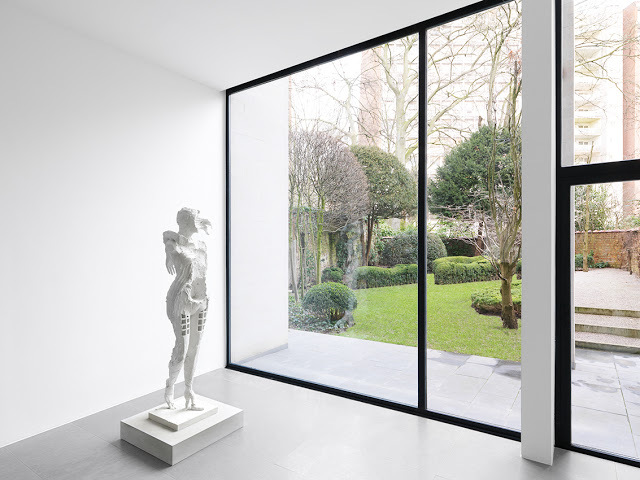 These structured sculptures with hidden mirrored inner spaces are now turned inside-out, reflecting the spectator and the room. 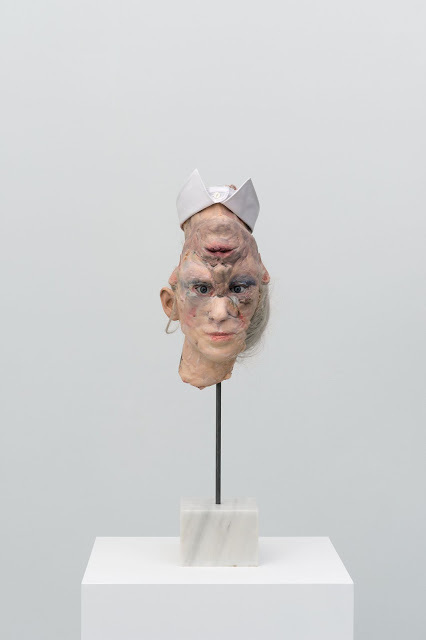 The head is a recurring theme in the work of David Altmejd. Here, La galerie des glaces is a cast of the artist’s head, acquiring a dual identity, feminine and masculine, and sharing a single pair of eyes. 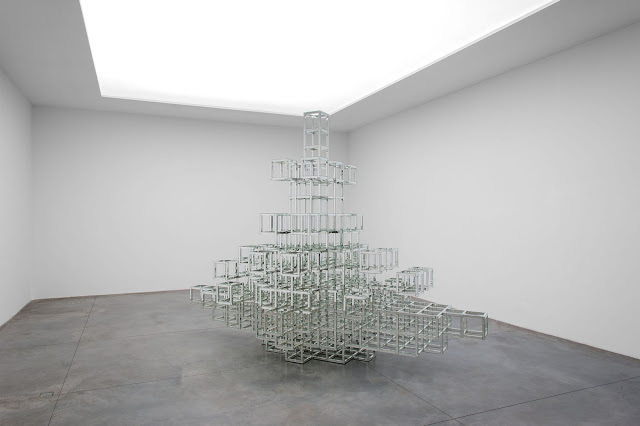 The sculpture can be alternately turned up or down, in its complex identity. 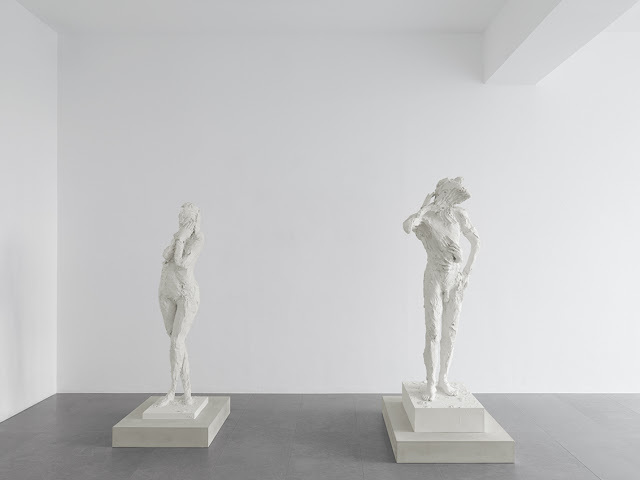 The Bodybuilders series, central in this exhibition, is presented as a set of six bronze sculptures, initially conceived in plaster. The Bodybuilder uses its own means to modify its own body and its own volume. 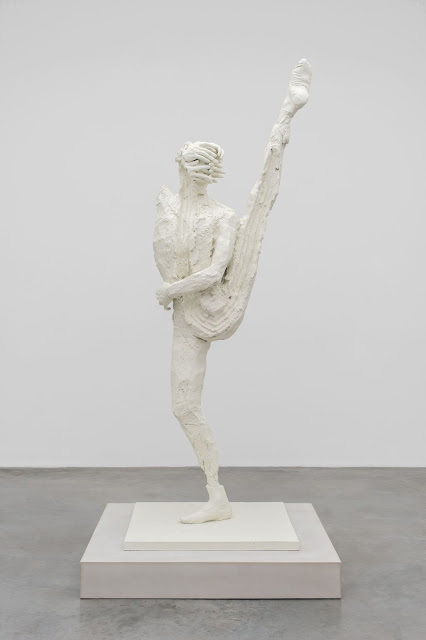 The sculpture, in its movement, displaces the matter of its legs up to its shoulders and transforms itself into a body in tension, on which the remaining trail left by the fingers that moved the material can be seen. 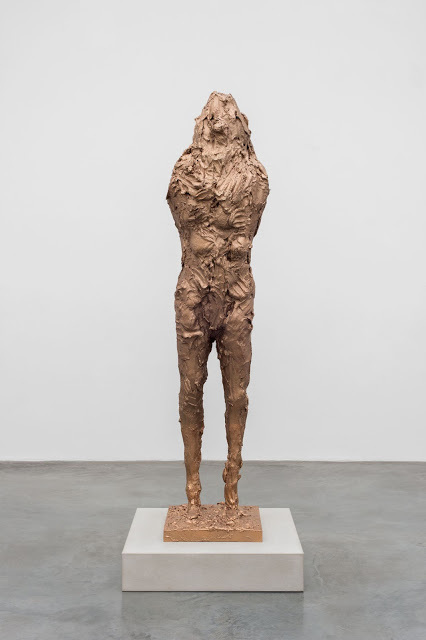 The sculpture constructs and deconstructs its own shape, leaving some visible vestiges of reality, such as cast feet or hands. 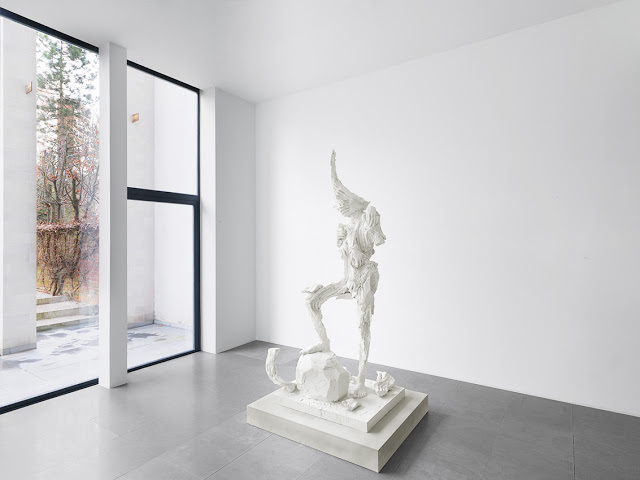 L’Air, a light and bright exhibition, with tense sculptural presences, is on view until the 9th of April 2016 at the Xavier Hufkens, in Brussels. 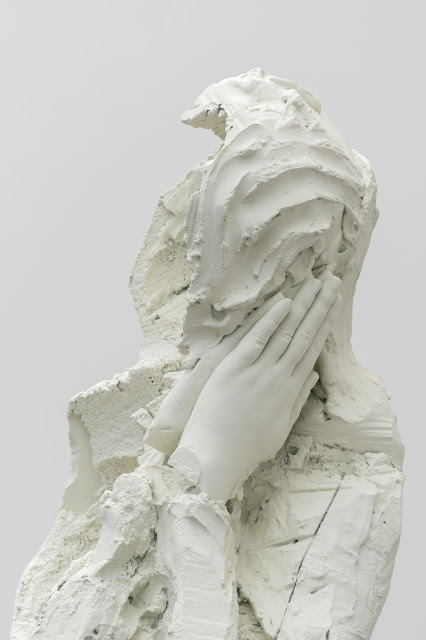 The exhibition Géants by David Altmejd can also be visited at the Forum of the Royal Museums of Fine Arts of Belgium until the 21st of August 2016. Installation views, David Altmejd, ‘L’air’, 4 March—9 April 2016, Xavier Hufkens Photo credit: Allard Bovenberg, Amsterdam. Courtesy: the Artist and Xavier Hufkens, Brussels. David Altmejd, ‘La galerie des glaces’, 2016 polyurethane foam, epxoy clay, epoxy gel, resin, acrylic, paint, synthetic hair, rhinestone, glasseyes, steel, marble, cotton shirt collar, 71,5 x 19 x 28 cm, ALTM-139-2016. Photo credit: HV-studio, Brussels. Courtesy: the Artist and Xavier Hufkens, Brussels. David Altmejd, ‘Matrix 2’, 2016 Mirror, steel, 309,9 x 393,7 x 185,4 cm, ALTM-130-2016 Photo credit: HV-studio, Brussels. Courtesy: the Artist and Xavier Hufkens, Brussels. 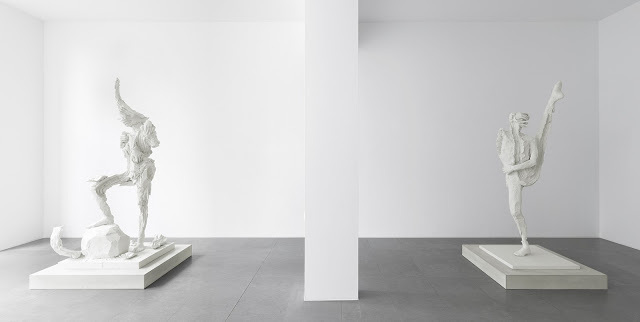 David Altmejd, ‘La pause’ (edition of 3 + 2 AP), 2016 bronze, 172 x 40 x 40 cm, ALTM-081-2016 Photo credit: HV-studio, Brussels. Courtesy: the Artist and Xavier Hufkens, Brussels. David Altmejd, ‘L’heure’ (edition of 3 + 2 AP), 2016 bronze, 217 x 85,5 x 75 cm, ALTM-124-2016 Photo credit: HV-studio, Brussels. Courtesy: the Artist and Xavier Hufkens, Brussels. 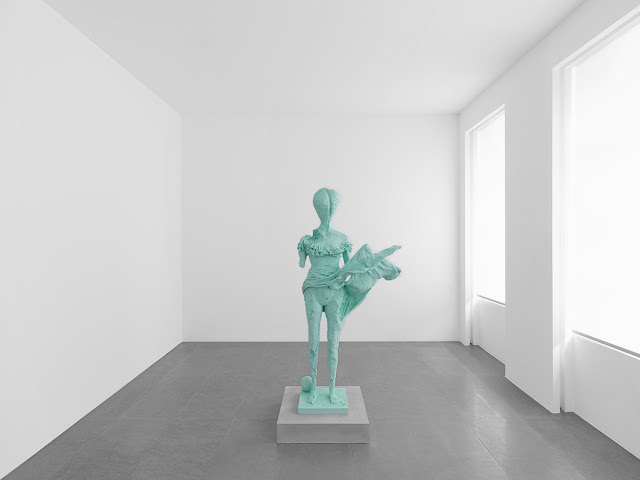 David Altmejd, ‘Figure s’inclinant vers l’avant le plus possible’ (edition of 3 + 2 AP), 2016 bronze, 181,7 x 40,5 x 51 cm, ALTM-087-2016 Photo credit: HV-studio, Brussels. Courtesy: the Artist and Xavier Hufkens, Brussels. David Altmejd, ‘Matrix 1’, 2016 Mirror, steel, 345,4 x 246,4 x 205,7 cm, ALTM-129-2016. Photo credit: HV-studio, Brussels. Courtesy: the Artist and Xavier Hufkens, Brussels.